The Hills Are Burning: I DO NOT PLUG IN YOUR EQUIPMENT. I DO NOT PLUG IN YOUR EQUIPMENT. Found this photo while searching the Internet for a picture to go along with this post and I couldn't not include it. 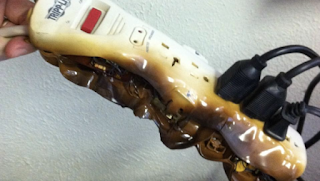 While it's technically off subject, the title is "Do not plug space heaters into power strips." One of the things set electricians HATE to do is run power for Production, namely for things like heaters. They're usually about half a dozen or more of them scattered about, you can't cube two of them together because they each need their own dedicated circuit, they're placed in the most inconvenient places where the closest distro box is 100ft away, they need them plugged in "right now!" (never mind you're in the middle of a lighting set up), and the P.A.s usually move them around at least twice (and you've powered them at least twice) before they finally settle on a place for it and you never reap the benefits from them, namely because they're dedicated for people who do nothing but sit around for most of the day. It's bad enough that we have to* run power to them, but the other day an AD was getting on my last nerve about it. The poor actors were getting cold on our warehouse stage (aka: not a real stage) so in came the heaters. Seeing them land, I ran the appropriate stingers to them before being asked to. Five minutes later, the room hadn't gotten any warmer and the AD turned to me. "Didn't you run power to these, A.J.?" He kneels down to fiddle with one of the knobs before noticing it wasn't plugged in. "Really? You didn't plug it in?" "Nope, I just run the power. I don't plug things in for other departments." "Oh, come on, A.J. We're on the same team here," he scowled at me before plugging in the heater and walking away. I DO NOT PLUG IN OTHER PEOPLE'S EQUIPMENT. "Come on, A.J.," you or the AD might ask, "What's so hard about plugging in a heater?" Well, for starters, I don't know this heater (nor do I care to). If I plug it in, will it turn on automatically? If the switch was left in the "on" position, and I walk away and someone knocks it over and it burns a hole in the rug or catches something on fire,** I guarantee all eyes (and fingers) are going to be pointed at me. And if it doesn't turn on automatically, am I supposed to turn it on, too? What if the switch is broken or doesn't work? How much time am I supposed to spend troubleshooting it? Is the toaster oven the food stylist is using set to "broil"? Will it just turn on if I plug it in when she's not around? Oops, did I just burn the hero food she was keeping in there? Is the reservoir in the coffee maker at Crafty empty? If I plug it in while the switch is "on" and there's no carafe in place, who's supposed to clean up the scalding hot water that is now spilling everywhere? Sure, it may only take a minute or two to figure some of this out, but 1) that's not the point, 2) it's not my job, 3) it's someone else's job, 4) it's not my responsibility, and, most importantly, 5) I don't want it to be my responsibility. Simply put: Just because we're the "electric" department doesn't mean we're responsible for operating anything with a cord coming out of it. We also never give a mouse a cookie. *We technically don't have to. Our job description and title clearly state that we're Set Lighting. Read: we light the set. But it's also easier and saffer for us to do it than anyone else. We pick our battles. **Yes, I know newer space heaters have a safety switch on the bottom that shuts it off if it's tilted. I've also worked with a few where the switch was bypassed. And no, I'm not going to take the time to figure out if it even has a switch, let alone if it's working properly. You are absolutely correct !! You state clearly as to why you wont plug or power it on, but instead of knowing someone is expecting/requiring/needing it on and doing nothing about it, why not be proactive AND a team player, and inform someone about what is needed and why you didnt do it yourself? It seems you were of no help and just wasted time here. Be proactive?? Because priorities dictate otherwise. Providing power and powering up essential items is job one, not pandering to some silly who has cold feet. That's the PAs job. Michael, Ed - Thank you! Anonymous - In this case (as it usually is) the P.A.s are the ones responsible for the placement of the heaters. They didn't just magically appear. I didn't set them out in a dark corner, run a stinger to it, then laugh maniacally as the AD wondered why the room was still chilly. They were placed there by the P.A.s who know fully well they need to be plugged in, and they usually do so after asking us for power. Where did the P.A.s disappear to after setting down the heater? I don't know. They probably got pulled away to do some other thing they're underpaid for. Unfortunately, I couldn't hunt them down and inform them of the hot stinger by their cold heater because I had my own job to do. And I'm not sure how I wasted anyone's time. No one was waiting on me or the stinger. And because I didn't stop doing my job to search for a P.A., the set was lit in a timely matter and our shooting day didn't get any longer because of it. The only one really affected was the actor who had to wait a few more minutes before the room heated up, although again, I'm not sure how that "wasted time." But thank you for pointing out this gap in my story and allowing me to provide further detail. JD - Yup, job one is lighting the set. Everything else is a courtesy. I wish more ADs knew this.